Mutton Bustin' toys . Mutton Bustin' T-shirts, vest, helmet. belt buckles. Mutton Bustin' birthday party. Mutton Bustin' Coloring Page. Gift ideas for mutton busters. Mutton Buster Christmas ornaments, gift wrapping and stockings. 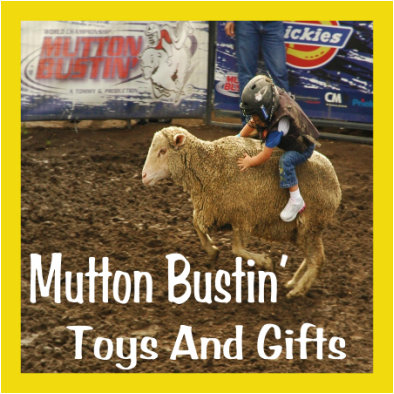 Mutton Bustin' is a rodeo event for kids. Some do it just for fun while others see this as one of their first steps to the bull riding arena. It is a very popular and fun event for everyone to watch. If you have never seen Mutton Bustin', here is your chance. Take a look at the video from the Houston Livestock Show and Rodeo as the kids get ready and then take their ride. The junior size vest for mutton busters and calf riders has a Cordura outershell and high density foam and plastic inner shell and velcro adjustments. It is black overall with leather pockets and trim along with a Saddle Barn Pro rodeo Equipment patch. This is a one piece molded shell helmet that has an impact absorbing hydrophobic EPP liner. It comes with a youth size wire face mask attached to the helmet. Montana Silversmiths has a nice looking Mutton Bustin' Belt buckle that can be used for rodeo prizes or just to wear. It has a licensed PRCA Pro Rodeo Logo on it and looks really good with western style flower accents and red stones. Kids will also like this buckle that has a Mutton Buster on it along with the words Mutton Busting Champion. There is another one like this that has a blue background. For the mutton buster who has already started winning some buckles, here is a 3 buckle stand with a mutton buster emblem on it to show off those buckles. It is laser cut from 18 guage steel and has a black wrinkle powder coat. 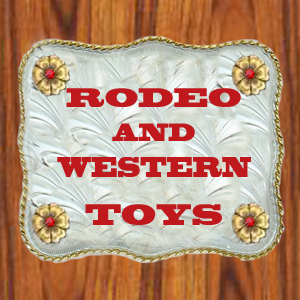 I have more pages of rodeo toys with something for every event. Here is the mutton buster and a couple of other sheep toys that kids will like having to play with or collect. Mutton Bustin' toy with sheep and little cowboy. Little Mutton Busters can get an early start practicing on this rocking horse style sheep. It is recommended for age 1 and up. The height at the seat is 11.8 inches. Kids love teddy bears and other stuffed animals. I'll bet little mutton busters will like this soft and huggable stuffed sheep toy too. Yea! Finally a ride on Mutton Buster toy. This toy is recommended for kids 18-36 months old and it comes with a riggin' to hold on to and an air pump. The chutes are NOT included but are listed just below. These bucking chutes are really cool and I know that any little Mutton Buster would love to have one at home. I have a lot of ride on bounce toys on my rideable horse toys page and On the Bull Riding Toys Page. 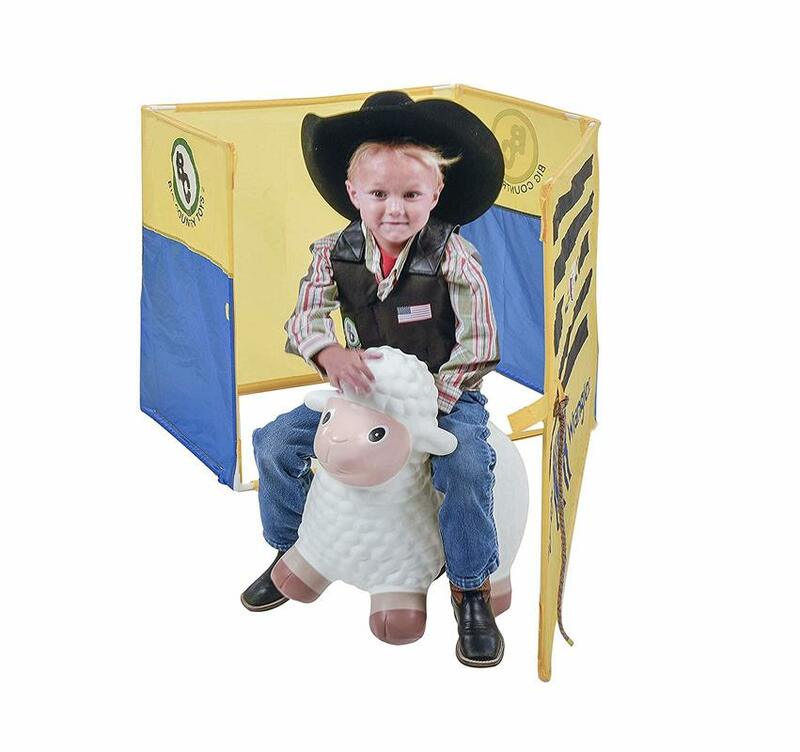 The Bull Riding Toy page also has kids chaps and spurs. Get one chute and a different bouncing rodeo toy animal for different kids and have yourself a RODEO! I think these are some of the cutest things. Just add a kid items have the printing all the way up to the neck so the kids face becomes part of the design. They are made of cotton and machine washable. This t-shirt will fit 0-6 month sizes. 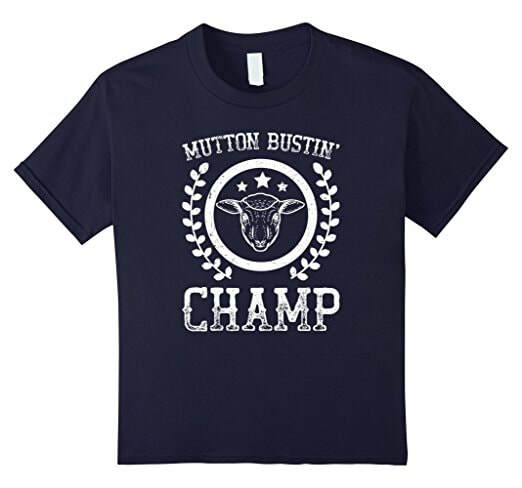 This mutton buster t-shirt is available in 2t through 4t. You can get the full size free printable version of this mutton buster coloring page and other rodeo coloring pages here. I also have free printable pages with rodeo bingo, rodeo word scramble, party banners and other fun stuff. Grab some for the kids. Here are a few examples of mutton bustin' merchandise and apparel that you can find in my Rodeo Days Store​. Many items can be personalized with names or other text. I work on more designs and add new things often. Check out the latest in mutton bustin'. I have recently added some new designs to number of items. 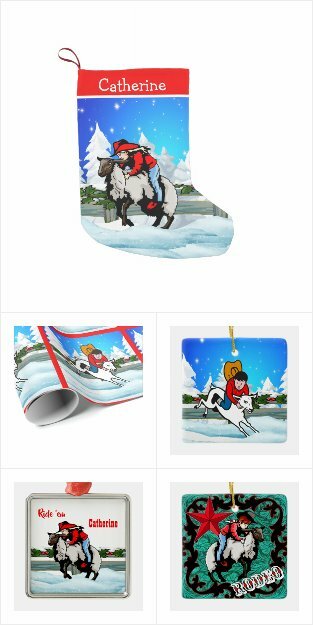 These are available on party plates, napkins, wrapping paper, greeting cards, fabric, pillows, backpacks, shower curtains, bath mats, lamps, stickers, magnets etc. Select from many different styles and colors in baby, toddler and kid sizes. Of course, any Mutton Bustin' shirt is fine for girls, but I have added a couple of new designs that I hope my cowgirl friends will like. The Watch This design comes in 3 different versions including, "Hold my Purse and Watch This" , "Hold my sippy cup" and "Hold my bottle". ​The other one is "Don't you wish you could Ride like a Girl". Here are examples of the other Watch This designs and examples of the variety of styles that are available. The kid in this artwork could pass for a boy or girl I believe. 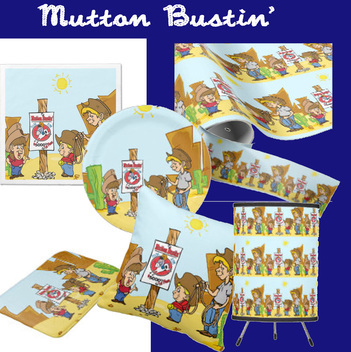 Mutton Bustin' Christmas Stockings, Wrapping Paper, Stickers and Ornaments. Check out the new Christmas items for Mutton Busters. Girl and boy characters designs.